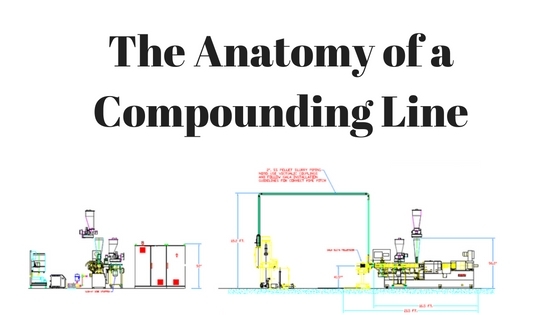 What Makes Up a Compounding Line? Compounding is the method of preparing a plastics formulation by mixing or blending polymers and additives to achieve a range of properties based on the user’s performance needs. Dispersive and distributive mixing are important factors for creating a homogeneous blend of the raw materials. Compounding is most often done by extrusion. There are three general compounding type machines. They include Twin screw, Single screw, and hi-intensity mixers. Twin screw compounding is the most popular and versatile compounding method. A typical compounding line consists of the follow: mixing, feeding, the compounding extruder, pelletizing, cooling, drying (if necessary), segregation and packaging. The production and compounding process has several different steps. It happens a lot like baking. We first start with raw material that are mixed according to the formula. It is like the ingredients of a recipe, we weigh and measure them each carefully. The feeders send the ingredients into a mixer to make one homogeneous mix. The base resin is gradually fed into the extruder from the hopper. The resin is carried towards the die by way of the rotating screw(s). The screw, located inside the barrel, is controlled by the operator at the machine’s control panel. The operator can modify the heat zones according to the processing parameters and resin properties. This allows the operator to oversee the quality during the additional mixing and processing stages. Once thoroughly compounded the melted resin is extruded through a die on the extruder in a strand form, a lot like spaghetti. These strands are quickly cut to a desired length and cool while being transported via a water bath to a dryer. * The dryer catches and separates the pellets from the water bath and removes excess liquid from the pellets. Once of the last steps is to pass through a classifier. The classifier insure that each pellet meets our strict quality standards for pellet size. They are then dropped into a lined gaylord box. Some manufactures also bag their product. This depends on the properties of the product as well as the shipping requirements. Once the pellets enter the box they have been fully compounded. The final product passes rigorous quality standard tests before being prepared for shipment. To learn more about our processes check out our Start Today page. For more on out technologies jump over to the Technology + Chemistry center. *Methods vary for different materials being compounded and from manufacturer to manufacturer.